The primary function of I/ITSEC 2018, the world’s largest modeling, simulation and training conference held annually in Orlando, is to demonstrate a promising exchange of information among industry, the military, and the educational communities. Ranging from the keynote addresses, to the exhibit hall and demonstrations, the conference was filled with discussions about preparing the warfighter to train as they fight on the battlefield. Among many vendors present, were several showcasing target capabilities. 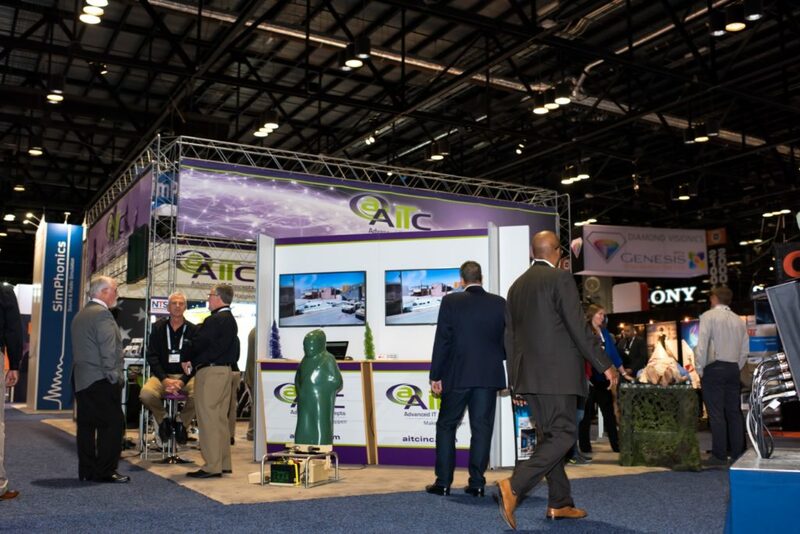 AITC offered insight at our exhibit, to show and provide military training leaders and industry some of the latest technologies available – even if they’re still developing – as a way to know what is possible and how it can help the military meet its training goals. As part of our interactive demonstrations, AITC showcased an end-to end solution for the military which involves target practice with a Stationary Infantry Target (SIT) or a SIT lifter. This lifter had a 3D Ivan silhouette that was about three feet tall, but there are larger lifters available for vehicle targets. These digital targets are typically used in live fire ranges, where soldiers use lasers to shoot instead of live ammo. The SIT can also be outfitted with sensors that soldiers can aim and shoot at. There are other capabilities available which can show where the laser round hit the target. The targets are controlled via laptop through a government-owned computer program called TRACR (Target Range Automated Control and Recording). This software allows the SIT to be fully controlled in any given scenario, and that can be through a direct cable connection, a Wi-Fi connection, or an LT connection. The SIT is battery powered, but it can be operated on solar energy and electricity. With these features, live fire range trainings with this SIT and the TRACER can be more mobile and can be taken to more remote areas. Field cameras can also be used to show how trainees perform during target practice. AITC helps as a system integrator and creates added benefits to military customers by taking all of these components – SIT lifters, computers, the software, the necessary internet connections and other equipment – to provide an end-to-end IT solution. “In order to set up a live fire range, AITC can plan and set up the entire operation without the burden of dealing with hardware and software complexities,” says Steve North, AITC Senior Systems Engineer. This is just one way that AITC provides tailored IT solutions for customers. To learn more about how AITC can leverage our partnerships and expertise to help your organization, please contact Lydia Perez in the sales department at sales@aitcinc.com.